To participate in the FAITH graduation ceremonies, a student and their family must be members in good standing during the entire school year in which they want to participate. This allows students and families to get to know each other before planning this special occasion. Parents and students plan the graduation ceremony by choosing the date, location and activities such as formal ceremony, video slide presentations for each student, presentation of diploma, and following reception/party. FAITH donates $150 to each graduating class to be used as they see fit, however all other expenses are covered by the families of graduates. 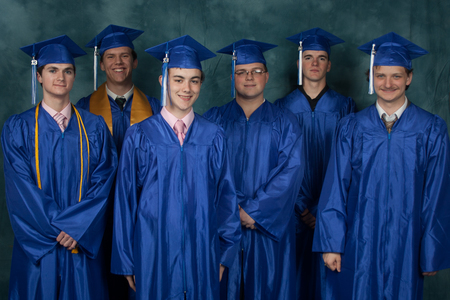 To ensure uniformity from year to year, FAITH encourages graduates to order supplies from www.homeschooldiploma.com and use the "royal blue" traditional cap and gown. The FAITH President is available to speak however, the speaker choice is made by the graduates and their families. As always, all activities must abide by FAITH's General Policies and Procedures and be done in an orderly manner. Music does not have to be approved but should be "clean" and not offensive.